Looking for the ultimate testing solution? Racelogic produces high-speed GPS and Video data-logging & simulation systems for the automotive industry. The new VBOX 3i with IMU integration offers accurate results even in obstructed environments. Used with the Racelogic Vehicle Separation system, VBOX 3i offers ±2cm positional accuracy, ideal for ADAS and ACC testing. For a live visual element to your testing, Video VBOX combines a high quality solid-state video recorder with a 10Hz GPS datalogger and a real time graphics engine. This means that it has the ability to graphically overlay fully customizable vehicle CAN and GPS data onto video for easy analysis. 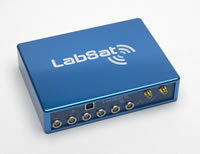 The new GPS simulator, LabSat, is an innovative and low-cost system for navigation system testing and development. It gives you the ability to record and replay GPS RF data, as well as user-generated scenarios. If you’re testing or developing products incorporating GPS engines, then you’ll find LabSat makes your job easier and more effective. Based in the UK, Racelogic has developed GPS data-loggers, Video overlay systems, GPS Simulators, CAN Interfaces and Traction Control since 1992. Its flagship VBOX is now used by over 200 different automotive companies in over 55 countries. VBOX has become an industry standard way of measuring speed, position, distance and acceleration. It was awarded the Queen’s Award for Enterprise 2007, and is an ISO 9001 company. Household names using Racelogic products include BMW, Ford, Pirelli, Goodyear, Porsche, Ferrari, Aston Martin, Toyota, Honda, the US Army, JCB, Bosch, and BP.